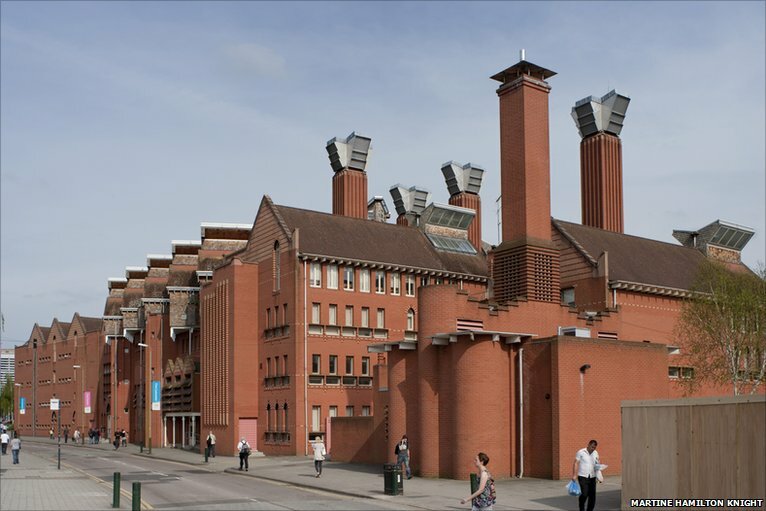 Chimney-like structures at the Queens Building, Leicester University are used to induce stack ventilation. The stack effect describes the passive movement of air through a building resulting from differences in vertical pressure developed by thermal buoyancy. When air inside a building is warmer than the outside air, the warmer, the less dense air will rise. Stack ventilation takes advantage of this effect by constructing openings in the building envelope high at a substantial height, allowing the warm air to escape. The negative pressure at the top of the building draws in colder, denser outside air through openings low in the building. Naturally, this effect is fairly weak, but it can be concentrated through the use of a stack. Longer stacks will typically increase airflow. Controlled stack ventilation can allow for passive cooling in the summer with some benefits over mechanical ventilation including low maintenance and operating cost, minimal or no energy costs, and typically lower construction costs in new buildings, as passive stack ventilation is designed similarly to mechanical ventilation without the mechanical components. Passive stack ventilation is generally rare in the United States, but is fairly popular in buildings in Europe. Building Section: The Queen’s Building, De Monfort University, Leicester England. While stack ventilation can have cooling benefits in the summer, it can be problematic during cold winters, as the high temperature difference between the building interior and exterior can result in overventilation and unwanted building heat loss. Conversely, underventilation can occur even with large ventilation openings when temperature differences are low. Even when temperature differences are sufficient to facilitate adequate stack ventilation, upper floors in larger buildings can be underventilated. Ventilation stacks, particularly in larger buildings, should be designed with some method of flow control, such as self-regulating vents, pressure sensitive ventilators, or fans (including solar powered fans). Some systems may need backup mechanical ventilation as well. •Allows for building cooling and ventilation with lower maintenance and operating costs than mechanical systems. Minimal operational noise. •Fully passive systems require no additional energy. Stacks supplemented by active flow control use less energy than equivalent mechanical systems. •Reduces building cooling energy needs. Can be combined with passive cross-ventilation to maximize ventilation. •Due to reliance on natural forces, overventilation and underventilation can occur frequently. •Proper design and flow control are necessary to maintain adequate ventilation rates. •Ventilation can be inadequate on upper floors of larger buildings, trapping heat and reducing air quality. Installation of operable windows may be necessary to facilitate ventilation. •In winter, the high difference in temperature between the building’s interior and exterior can result in overventilation and heat loss without adequate flow control. This entry was posted in Santa Cruz Architect and tagged building energy, green building design, passive solar design, sustainable building practice on May 16, 2015 by santacruzarchitect.